Professionals often spend several work hours trying to schedule meetings using outdated scheduling methods, such as emails and phone calls, while such time wasted could be better spent creating more sales opportunities for your business. However, in this digital world, arranging a meeting does not have to be challenging, and increasingly, organisations are using digital tools, such as meeting room scheduling software, to maximize their efficiency and improve employee productivity. Let’s take a look at some key benefits to using these systems. Problems often arise when there’s a limited number of meeting spaces that many stakeholders need to use. A meeting room scheduling software can help you schedule meetings and solve common problems, such as schedule conflicts, empty meeting rooms, unclear signage, or employees using a room without a reservation. Meeting room scheduling software saves meeting room users time because they can quickly view available meeting rooms, invite attendees and review useful details about each meeting room, such as their maximum capacity and floor plans. Meeting room software enhances your staff’s productivity and allows them to focus on key areas of service. With a meeting room booking system, you can download its application on your Android or iOS mobile phone or tablet, and with just a quick tap of the buttons, you’ll be able to access room availability, schedule or reschedule your meetings easily, or find a list of available rooms instantly while you are en route to an impromptu meeting or in the midst of a quick lunch. Most meeting room scheduling systems should be able to integrate with your current infrastructure easily. Some better Meeting Room Scheduling can even integrate with major calendaring systems, such as Google, Microsoft Exchange, or Office 365, and recommend available rooms based on user preferences, making it easy for you to schedule or reschedule a meeting quickly. With such integration, you can view your booking status and schedules within a centralised web-based display at a glance on your desktop, mobile phone, or tablet and manage your booking easily without the need to change settings from every device. 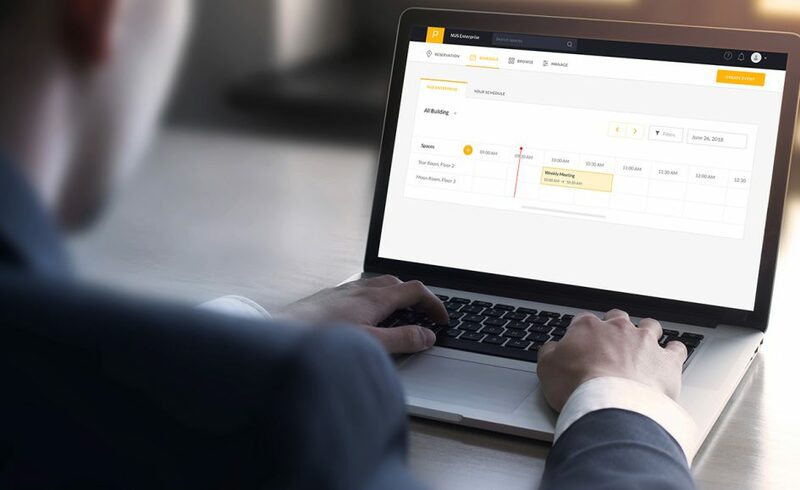 This makes it very easy for your staff to manage any meeting room booking and prevents scheduling errors because all the information resides in the same system that is updated in real-time. Such a centralised display can also help eliminate the double booking of meeting rooms. For instance, it can be very frustrating if you or your colleague booked a meeting room at the same time, resulting in double booking. In this case, having a meeting room scheduling software is very useful because at a glance, you will know which meeting rooms have already been booked and at what time slots, so you can look for another meeting or conference room at a different time. A meeting room scheduling software can also let you access real-time room booking data and track the company’s space usage and analyse user behaviour. This is very useful for understanding the usual meeting duration, when your staff makes meeting room reservations, how many meeting rooms are being used daily, peak hour usage, average attendees, and many other useful statistics. These statistics help you optimise your existing resources and lower costs. For example, they might help you decide whether to use spare meeting space for offices or convert some office space into new meeting rooms. Sometimes, when meetings are cancelled, participants do not instantly cancel their room reservations. A meeting room reservation system has monitoring sensors to alert the system when a room is vacant or if no one enters the room to tap the “start” button, automatically notifying other employees of the room’s availability so that they have time to adjust their schedules. In this way, you can maximize your workflow and utilize your space better, as well as avoid unnecessary frustrations and wasting employees’ time. With such meeting room scheduling software and tools, it’s now easier than ever to track how your meeting rooms are being used, find out how you can further utilise your workspace with useful, insightful analytics and increase productivity. So start taking control of your meetings now!